Vogel Zoo: "Viewer Discretion Advised"
Tomorrow begins the second leg of this journey. At 9:00 I am starting my first dose of chemotherapy. The treatment tomorrow is supposed to last about 5 or 6 hours. Wednesday and Thursday will be an hour or two each. I am a little bit scared and at the same time I'm kind of relieved to begin so that I can finally be done and move on in my life. Let me back up a bit. Up until last Thursday we were in quite the quandary trying to decide about whether or not we should take Methotrexate. Thursday night JoLynne and I went to the temple with Shanelle and Mike. Mike had a cough. I was exhausted. Shanelle and JoLynne were feeling okay. Each of us received a clear answer in our own way. I wasn't feeling well and I told Heavenly Father that I didn't feel well and I wasn't up to figuring out a "subtle answer". I was blessed with a very clear, undeniable answer that we should not do the Methotrexate. I trust that God knows whether or not that drug would be of value to me. He clearly told me that it was unnecessary. I am so grateful to be able to go to the temple and to receive answers. Sunday was a busy day. I got up at 6:30 to go to meetings. We met until about 9:30 then we had two elders quorums presidencies to set apart at 11:00 then church at 1:00 and another Elders quorum presidency at 2:30 then temple recommends at 4:00and more calling to extend at 5:00. I arrived home just after 6:00. I had hoped to go to a viewing of a friend but there just wasn't time. We had a High Priest quorum meeting at 7:00 and finally home at 9:00. I should have been absolutely exhausted. Usually just working a morning tires me out. I was tired but not beyond reason. I really felt like the Lord blessed me with more strength than I would have normally had to do his work. 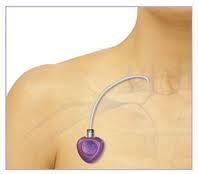 This morning I had a surgical port placed in my chest to administer the chemotherapy through. A port is like a junction box placed just under the skin and then a tube runs from the box to one of the big veins near your heart. It gives the doctors and nurses a good way to draw blood, give chemo etc without trying to find a vein. I was a little nervous but everything went without any problems. I know it was nothing like the last surgery but suddenly the thought of someone cutting on me just kind of freaks me out. I am grateful that everything went well. I was trying to convince my children that with a port in place I would now be able to upload information directly to my brain using a USB drive. I don't think that they believed me but you have to admit, it would be way cool. This evening I had a blessing from my father and a dear life long friend. Just when I think I have my tear glands under control I find out that they have a mind of their own. I find that these days I cry most easily when I feel the Lord's love for me or when someone I love does something that shows me how much they care. Mostly happy tears. The friend who helped to bless me is the father of my best friend growing up. He is a good man and a dear friend. This evening another friend from the Food and Care coalition came by with a picture that was drawn by one of the cooks at the Food and Care. It was taken from a photo taken in Russia when I worked on a sweet little, terrified girl. It broke my heart to have to hold her down to treat her but her mother assured me that if we didn't do the work then nobody would and her toothache could result in dire consequences. She screamed and cried throughout the treatment. I thought she would hate me forever. Instead, after finishing the work, this little girl reached up and put her arms around me and hugged me. That is when they took the picture. A very tender moment for me and a sweet memory. Okay, there goes more tears. Oh well. Someone told me that they wanted to know what was going on with my leg. Well, it is healing slowly. As you probably know they took the whole middle part of my fibula from my right leg to make a new jaw. In addition they also took the muscle and the skin to use as filler in the jaw reconstruction. I read today in a copy of the charting that was sent to me that my right leg had a tourniquet on for over 40 minutes. No wonder that leg is kind of tender. I'm glad it didn't fall off. Needless to say the hole where they stole the bone and tissue was sizable. They couldn't leave that open so they took a piece off my right thigh and transported it to my calf to close the hole. My thigh is just healing up slowly on it's own. It is a really cool, very rectangular scab. The grafted tissue on the lower leg is also healing well. The leg bone is now missing six inches out of the middle of the bone which will always be gone. I have to treat it like a broken bone, wearing a cast and limiting pressure on the limb. Today was the first day I could replace my crutches with a cane. (made by my dear neighbor). Two more weeks and I should be able to take off the cast. The bone won't grow back together but I guess with time the muscle will bind and splint the two broken ends so that they don't move. It hurts a bit but not unbearable. I am going to have some pretty impressive scars when this is all done. JoLynne won't like it, but here is a picture of my calf. It really is looking a lot better. All of the pink area is where the blood supply has re-established. It is so miraculous what modern medicine can do. That leg wound is wicked awesome! And the story and pic of you and the little girl is so precious. Keep on keepin' on. Glad to see you're recovering well. You're in our prayers. Thanks Stacy, Your'e the best. I guess today it will be my turn to scream and cry. After all this time, I still really hate shots. You would think I would be used to them by now. It doesn't matter how many surgeries you go through, how many shots you need, or how much pain you've experienced...it is still difficult every time. My deepest sympathies! William and I want to stop by this week- not sure when tho. Eric-I just want you to know that you and your family have been in my family's thoughts and prayers (When Miriam prays, she refers to you as the "bunny man"). Thank you for being the amazing, wonderful person you are. You are such a blessing to my family. I wish you the best and a quick healing and recovery. Take care through your new journey of chemo. Eric! WOW. I am always amazed when I read your blog. Amazed at the faith you have. Amazed that you can still do your calling. Amazed at your humor through all of this. And that meaty photo at the end?! Amazing! I have been following your blog so that I can be more precise in my pryers for you. Speaking of putting on weight, I make a wicked Creme Brûlée, let me know if you are up to trying it, and I'll bring it over. That picture of your calf is way out there. No wonder you are tired, your body is doing some intense healing. Keep your head up, and stay faithful. It is amazing to see the hand of the Lord in your life, and know that He is truly our Father.